Over the summer a group of Scouts came to offer us their help. Among the various projects they undertook with us were the renovation projects we had planned. They helped us to repaint the refectory (tables, chairs and windows): it now looks completely new, all in red. The floor, however, remains to be renovated. 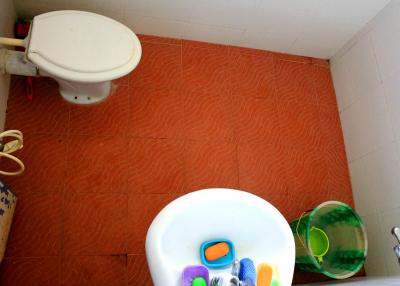 Its paint is very worn, and we hope to tile over it in order to make the space a cleaner environment. There are also two small areas of earth outside the kitchen that are often dirty and in the monsoon season become very muddy. We would like to be able to cover these spaces with interlocking paving. 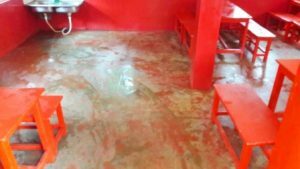 Two of the shower and toilet areas on the first floor of Nava Jeevan, where the teenagers live, are made out of concrete. Over time the ground has cracked and a large amount of water now leaks through down to the ground floor. In order to put a stop to these leaks it is essential we cover over the floor of the two rooms with tiles.